South Africa was bowled out for 450 runs in their first innings and Australia piled up 5-565 before Michael Clarke declared the innings. South Africa lost half of their side for 166 runs in their second innings when the match concluded after the second day’s play was washed out because of rain. 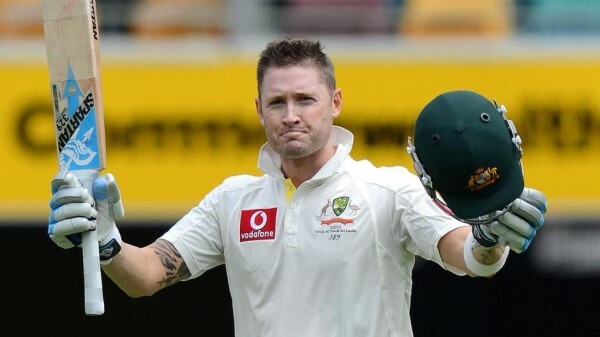 Michael Clarke (Australia) was declared ‘Player of the match’ for his heroic unbeaten knock of 259 runs. Australia was in trouble after losing 3-40 when he played an anchor role and took his side to glory. The first Test of the series came to an end on Tuesday November 13, 2012, at Brisbane Cricket Ground, Woolloongabba, Brisbane. Earlier, Asutarlia started the fifth day at 4-487 after 121 overs, their skipper, Michael Clarke and Michael Hussey were at the crease with the overnight score of 218 and 86 respectively. Clarke initiated his innings from where he left on the fourth day by scoring 14 runs in the first two overs with a couple of fours. Hussey kept on creeping until he achieved his 17th Test ton on the fourth ball of the 130th over but lost his wicket on the first ball of the following over for 100 off 129 balls with 13 fours. Clarke geared up and blasted his 250 in the 133rd over with 2 fours and declared the innings at 565 in 138 overs. Michael Clarke stood firm at his crease with 259 runs off 398 deliveries with 26 fours and Matthew Wade was at the other end at 19 as the home side gained a lead of 115 runs. Morne Morkel was the most impressive bowler with three wickets and Dale Steyn held one wicket. 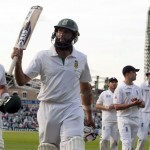 The Proteas lost the opener Alviro Petersen for just five runs as Hashim Amla got together with his captain Graeme Smith. The duo adapted the defensive tactics as the score reached 21 in 10 overs with just two boundaries. They crawled to 54 after 19 overs as Smith was caught by Rob Quiney at Gully off James Pattinson for 23 off 67 with 3 fours. 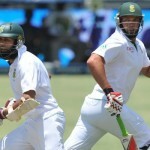 Jacques Kallis and Amla stabilised the innings while applying themselves but found it difficult to score the runs freely. Amla hit the first six of the innings on the fifth ball of the 30th over off Nathan Lyon. The 32nd over was the most productive one when Kallis punished Lyon for 17 runs with 1 six and 2 fours and the first hundred of the innings also appeared on board. 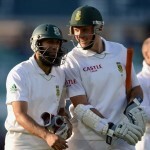 The third wicket partnership was extended to 102 when Hashim Amla was gone for 38 and was replaced by AB de Villiers. Tea was taken after the 38th over as the visitors scored 114 runs for the loss of three wickets and were trailing by just one runs with possible 41 overs left in the match. Both batsmen went back to their shells after tea interval and added just 15 runs in the next 10 overs. Kallis became the next victim in the 49th over for 49 as Jacques Rudolph came in the centre and enhanced the score to 165 before he was declared leg before wicket off Nathan Lyon for 11 runs. AB de Villiers remained unbeaten for 29 as play was called off when 11 overs were still remaining and South Africa scored 166 runs after losing five wickets in their second innings. James Pattinson and Nathan Lyon were the highest wicket takers with two wickets each as Peter Siddle held one. The first Test ended in a draw but Australia gained a lot in the match which will boost up their confidence for the next two games. South Africa should assess their weak points to maintain their supreme position in the Test ranking. 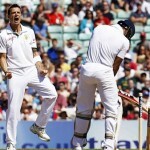 The second Test of the series will commence from November 22, 2012, at Adelaide Oval.